There is an old saying: "Lead, follow, or get out of the way!" I've decided to get out of the way. to coordinate things and have the meetings run smoothly. Church up the winding road, through the woods. Any questions call Mike @ 770-925-9085.
fill you in on the winners. Refreshments this month are by Suzanne and Steve Hughes. We will nominate new officers at this November Meeting and Vote in December. Hope to see you all there on the 14th ! Last month we discussed cameras from the 1950s and 1960s. I brought in a plethora of cameras to show, along with some printed information about the cameras. Larry, I and others commented on costs, characteristics and other features. The session was successful, with a couple exceptions. I had not used all of the cameras and couldn’t give much information on several, I didn’t have any handouts of the information on the cameras, and there really wasn’t enough time to cover that many cameras. This month, we will try to correct those issues. We will only cover 35 mm film cameras, saving the digital cameras until December, to allow more time per camera. Actual users will bring in the cameras, so they will be able to make better comments on the cameras. I may or may not have handouts. The references which I used were The Technical Page by Charles A. Piper, available from the Stereo Club of Southern California, and Stereo Cameras Since 1930 by Werner Weiser, available at better bookstores everywhere. Cameras which we would like to cover are RBT, Nimslo, Techno-Nimslo, FED, beamsplitters and?? There are several varieties of the RBT and FED, so bring yours in – this is a club session since I have no FEDs or RBTs. 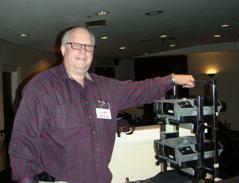 This is an opportunity to see new View-Master reels projected. We will have the latest from Mike Kaplan, the new Lookout Mountain and Rock City reels and other recent productions. If you have something, please bring it in. 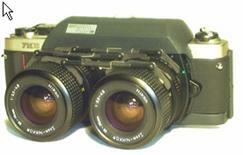 In addition, during the break in the View-Master projection, I will discuss in some VM and Meopta cameras and cutters. Rumor has it that Cynthia Morton Chapman will fly in for a demonstration of VM mounting. Otherwise, I will try to cut and mount a reel to project. 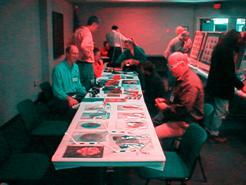 The 3D Fest was held on October 18, 2003, at the Decatur public Library and was a success. The 3DFest was a one day event inspired by the Cascade club's two day affair. 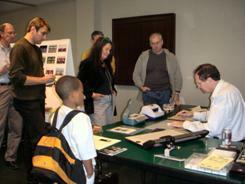 It was held in a central library facility with a projection theater and an exhibit/workshop room. The goals of the event were to get 5-6 new active club members, to showcase a wide range of excellent 3D for the public and to learn how to conduct a 3D event for the general public. Those were all met. One of my big learnings was how much interest and enthusiasm children can have for 3D. One boy spent at least an hour at the exhibit looking at every thing in detail. After looking through about 40 medium format slides in the viewer, he looked at Ted and said "your stuff is really tight". The video game generation can appreciate good 3D. We also learned something about how to schedule and advertise the event. For maximum attendance, don't schedule on a nice football Saturday in October! Secondly, the newspaper calendars didn't pull in any people. Our draw came from the library flow, Internet discussion groups, Marilyn’s posters at ACA, shop posters and Freeview. Participants included Bert Arps, Marilyn Morton, Bill and Krys Walton, Steve and Suzanne Hughes, Bill Moll, Mike Griffith, Larry and Julia Moor, Huck DeVenzio, Robert Dallas, Ted Baskin, Peter Bahouth, Les Hayward, Debbie and Al Hess, Don Handy, Bonnie Jean Woolger, plus the general public.